Great location by the sea!! 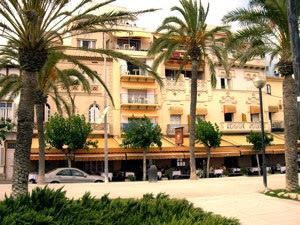 Øystein and John had chosen to stay at Hotel La Santa Maria located at Passeig De La Ribera in Sitges. This three star hotel offers spacious rooms, a superb beachfront location, and a great restaurant, that I will return to later. As Hotel Romàntic, this hotel has a lot of charm, but in a very different way. Wheras you enjoy the old world charm and the tranquility of the hidden garden at Romàntic, at Hotel La Santa Maria you are right where everything happens. Øystein and John had booked a large double room facing the sea. It had an old world charm, spacious with a high ceiling, tiled floor and french doors out to a terrace facing the blue Mediterranean Sea. A great space for a dripping cold bottle of white wine, as you enjoy the mild breeze from the sea. And they had an airconditioning that they could operate themselves. A good thing, as the downside to this location is the hotel restaurant where guests have their drinks long into the hot Spanish night. Then it is a good thing that you may close the doors - unless you want to join them, that is! I have a dilemma. Should I choose the old world charm and seclusion at Hotel Romàntic, or choose the terrace at the beachfront Hotel La Santa Maria? In this case I have a draw between the two. It does not help me a bit that the price level are the same. You get a double superior room for €124 a night during peak season, but I do not know whether they had to pay more for the terrace. In any case, I would! So I gladly recommend the two hotels. The restaurant at Hotel La Santa Maria was great. We discovered that as we dined there. But that is another story to tell. What happened to poor little piglet? 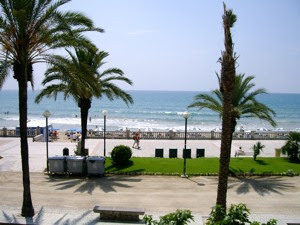 Lunch in Sitges - Al Fresco! !